Oral cancer is a serious health concern, and at Dr. King Scott’s dental office we want our patients to be informed and prepared. It kills more people nationwide than either cervical cancer or melanoma. The best thing you can do is to visit us regularly and educate yourself on the warning signs. If you see any of these symptoms, you should call our office right away. It is important to come see us every six months for your regular checkup, as we will check for signs of oral cancer. If you notice anything unusual it is important to call us, because the sooner oral cancer is detected, the greater the chance it can be treated. Your risk of developing oral cancer is increased if you’re a smoker, drink frequently and often, are in the sun a lot, bite your cheek or lip habitually, or have poorly fitting dentures. Twenty five percent of oral cancer cases are found in people who do not have any of these risk factors, so just because you don’t fit the profile doesn’t mean that you have no risk of developing this. 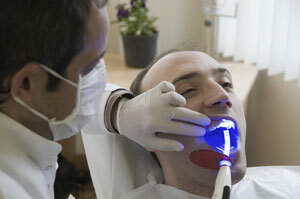 Oral cancer is a serious health concern. It is important to be informed and visit us regularly to ensure the continued health of your gums and teeth. For more information, visit The Oral Cancer Foundation.